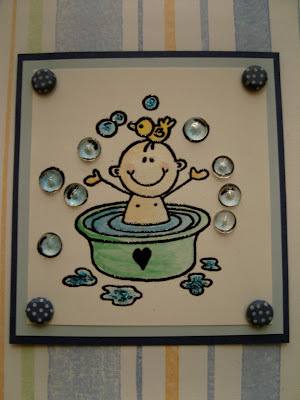 I always love to create baby cards. Friends of us just got a little baby boy, so today I made this card for them. It is just stamped and embossed with black powder, then watercolored with metallic watercolors (by Yasutomo). The stamps are by Woodware (Baby in Bathtube) and Heidi Swapp (Baby Writing). I added some dewdrops and stickles. The design paper is by Déjà Views (Sharon Ann Collection).